Sep 03, 2010 Iâ€™ve read your post and I apologize that you feel you werenâ€™t provided all the information in regards to the financing of your purchase. I also wanted to follow back and provide you some additional details regarding our financing programs. With approved credit, Empire does offer financing through GE Money and other providers dependent on the region where the customer lives. Our Sales Representatives have the credit applications and will provide them to the customer during the in-home appointment for completion of the credit request; it provides the details on the program. In addition, we also have the information on our website along with our Customer Service Team can also provide support if a customer has questions or needs additional information. Since Iâ€™m not able to pull the information on your account, Iâ€™m unable to comment on the financing promotion during your in-home appointment. 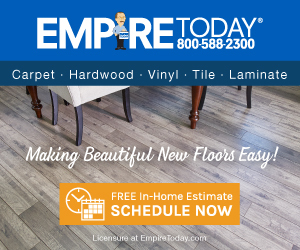 I do apologize once again, if there is anything that I can provide you additional details or answer any questions that you might have, please feel free to give me a call at 888-588-2315 x4195 or you can email me at customersupport@empiretoday.com. Rebekah Clerk, National Customer Service Manager. empire today gives out false information. their sales rep does not enclose that after the year of free interest if the consumer does not pay off the loan by the end of the year they will add the interest to the account..so there is no free interest..then it goes to ge money bank to be billed then to a collection agency to be harassed. the service is soooo bad and they do not communicate with anyone. do not use this comoany for any products or use their no payments for one year service. Review #151866 is a subjective opinion of User151866. I must say that your complaint is quite ridiculous. Charging interest if not paid off in 1 year is the policy of everyone. If you did not know this it is your fault. Empire should be banned as they have terrible carpet and will not hold up wear with just 2 people in the house. I was foolish enough to buy their carpet but I will never buy anything from them again.. Carpet that I bought just 1 year ago will need to be replaced in another year because of the shedding. PLEASE if you read believe me do not buy from them. I was told by the rep that if the loan was not paid off w/in one year, interest would be added to the total amt. owing. The contract also states this well known fact. I didn't pay a penny until the year was up and paid it off interest free. I thought it was great! Hey, how about reading the contract before you sign it.